Black, Brian. 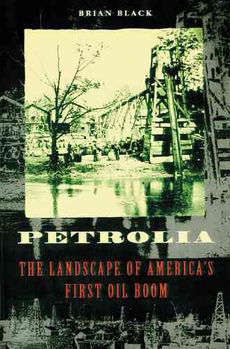 Petrolia: The Landscape of America’s First Oil Boom. Baltimore: Johns Hopkins University Press, 2000. In his book, Brian Black has revisited the oil fields of western Pennsylvania, the site of the first US industrial boom towns in the 1860s and 1870s, with the sensibility of a modern historian of cultural landscapes. The author offers us a multilayered portrait of this area, which seeks to capture the energy and danger of early oil exploration and to understand the myths of progress and opportunity that Americans wove in response to this new phenomenon. Besides providing a description of technological and administrative innovations and a basic account of the events and personalities that stand out in the story of Petrolia’s rise and fall, Black seeks to understand how Americans turned the utter destruction of a peaceful rural valley and its communities into a cause for national celebration. Why did we get “oil on the brain”, as a popular song called it, and how did it fuel support for what Black calls a “culture of massive disturbance” that created this “sacrificial landscape?” (Text adapted from an H-Net review by Robert Rakoff.) Brian Black is professor of history and environmental studies at Penn State University’s Altoona College.